Chocolate Coating (Whey Protein Concentrate, Palm Kernel Oil, Maltitol, Cocoa Powder, Sugar, Soy Lecithin [An Emulsifier], Vanilla), Supreme Protein® Blend (Whey Protein Isolate, Whey Protein Concentrate, Milk Protein Isolate), Peanuts, Peanut Butter (Peanuts, Salt), Powdered Sugar, Maltodextrin, Water, Protein Crisps (Isolated Soy Protein, Tapioca Starch, Salt), Hydrolyzed Collagen, Soy Lecithin (An Emulsifier), Vitamin Mix (Dicalcium Phosphate, Magnesium Phosphate, DL-Alpha-Tocopheryl Acetate, Ascorbic Acid, Copper Gluconate, Niacinamide, Vitamin A Palmitate, Ferric Orthophosphate, Biotin, Zinc Oxide, Pyridoxine Hydrochloride, Cyanocobalamin, Folic Acid, Manganese Sulfate, Calcium D-Pantothenate, Riboflavin, Sodium Selenite), Salt, Potassium Sorbate (A Preservative), Wheat Protein Isolate, Almond Butter (Dry Roasted Almonds). Peanut Butter Protein Coating (Maltitol, Palm Kernel Oil, Milk Protein Isolate, Peanut Flour, Peanuts, Nonfat Milk Solids, Soy Lecithin [An Emulsifier], Salt, Natural Flavors), Supreme Protein® Blend (Whey Protein Isolate, Whey Protein Concentrate, Milk Protein Isolate), Caramel Layer (Maltitol, Sweetened Condensed Milk, Hydrogenated Coconut Oil, Butter [Salted], Corn Starch, Vanilla Extract, Caramel Color), Glycerine, Peanuts, Water, Pretzels (Wheat Flour, Salt, Vegetable Oil [May Contain One Or More Of The Following:, Corn, Canola, Cottonseed, Soybean], Corn Syrup, Sodium Bicarbonate, Yeast), Soy Protein Isolate, Peanut Flour, Peanut Butter (Peanuts, Salt), Protein Crisps (Isolated Soy Protein, Tapioca Starch, Salt), Hydrolyzed Collagen, Palm Kernel Oil, Soy Lecithin (An Emulsifier), Vitamin Mix (Dicalcium Phosphate, Magnesium Phosphate, Dl-Alpha-Tocopheryl Acetate, Ascorbic Acid, Copper Gluconate, Niacinamide, Vitamin A Palmitate, Ferric Orthophosphate, Biotin, Zinc Oxide, Pyridoxine Hydrochloride, Cyanocobalamin, Folic Acid, Manganese Sulfate, Calcium D-Pantothenate, Riboflavin, Sodium Selenite), Salt, Potassium Sorbate (A Preservative), Wheat Protein Isolate, Almond Butter (Dry Roasted Almonds). Chocolate Coating [Whey Protein Concentrate, Palm Kernel Oil, Maltitol, Cocoa Powder, Sugar, Soy Lecithin (an emulsifier), Vanilla], Supreme Protein Blend (Whey Protein Isolate, Whey Protein Concentrate, Milk Protein Isolate), Caramel Layer (Maltitol, Sweetened Condensed Milk, Coconut Oil, Butter [salted], Corn Starch, Vanilla Extract, Caramel Color), Glycerine, Water, Protein Crisps (Isolated Soy Protein, Tapioca Starch, Salt), Soy Protein Isolate, Peanut Butter (Peanuts, Salt), Peanut Flour, Hydrolyzed Collagen, Peanuts, Palm Kernel Oil, Soy Lecithin (an emulsifier), Vitamin Mix (Dicalcium Phosphate, Magnesium Phosphate, DL-Alpha-Tocopherol Acetate, Ascorbic Acid, Copper Gluconate, Niacinamide, Vitamin A Palmitate, Ferric Orthophosphate, Biotin, Zinc Oxide, Pyridoxine Hydrochloride, Cyanocobalamin, Folic Acid, Manganese Sulfate, Calcium D-Pantothenate, Riboflavin, Sodium Selenite), Salt, Potassium Sorbate (a preservative), What Protein Isolate, Almond Butter (Dry Roasted Almonds). Contains peanuts, soy, milk, almonds and wheat.. Produced on equipment that also processes eggs and tree nuts. Chocolate coating (whey protein concentrate, palm kernel oil, maltitol, cocoa powder, sugar, soy lecithin [an emulsifer], vanilla), Supreme Protein® Blend (whey protein isolate, whey protein concentrate, milk protein isolate), chocolate protein wafer (soy protein isolate, palm oil, enriched flour (wheat flour, malted barley flour, niacin, reduced iron, thiamine mononitrate (vitamin B1), riboflavin (vitamin B2), folic acid], cooca (processed with alkali), sugar, soybean, lecithin, artificial flavor, salt, sucralose, sodium bicarbonate, yellow 5, red 40, blue 1), protein crisps (isolated soy protein, tapioca starch, salt), peanut butter (peanuts, salt), glycerine, hydrolyzed collagen, water, palm kernel oil, peanut flour, powdered sugar, maltodextrin, soy protein isolate, fully hydrogenated palm oil, peanuts, soy lecithin [an emulsifier], vitamin mix (dicalcium phosphte, magnesium phosphate, dl-alpha-tocopherol acetate, ascorbic acid, copper gluconate, niacinamide, vitamin A palmitate, ferric orthophosphate, biotin, zinc oxide, pyridoxine hydrochloride, cyanocobalamin, folic acid, manganese sulfate, calcium d-pantothenate, riboflavin, sodium selenite, thiamine mononitrate), flaxseed oil, beeswax, salt, potassium sorbate (a preservative). Allergen Information: Contains Peanuts, Soy, Wheat And Milk. Produced On Equipment That Also Processes Tree Nuts (Almonds) And Eggs. Supreme Protein® Blend 15 g (whey protein isolate, whey protein concentrate, milk protein isolate), chocolate coating (whey protein concentrate, palm kernel oil, maltitol, cocoa powder, sugar, soy lecithin [an emulsifier], vanillin), vanilla cream (high fructose corn syrup, corn syrup, milk protein isolate, fractionated palm kernel oil, soy lecithin, natural flavors), maltitol syrup, glycerine, chocolate protein crisps (isolated soy protein, cocoa, tapioca starch), water, fractionated palm kernel oil, chocolate cookie (wheat flour, sugar, canola oil, cocoa [processed with alkali], salt, baking soda), soy protein isolate, cocoa powder, soy lecithin, natural flavors, vitamin mix (dicalcium phosphate, magnesium phosphate, dl-alpha-tocopherol acetate, ascorbic acid, copper, gluconate, niacinamide, vitamin A palmitate, ferric orthophosphate, biotin, zinc oxide, pyridoxine hydrochloride, cyanocobalamin, folic acid, manganese sulfate, calcium d-pantothenate, riboflavin, sodium selenite, thiamine mononitrate), guar gum, flax seed oil, potassium sorbate (a preservative), peanut paste. Allergen Information: Contains peanuts, soy, wheat and milk. Produced on equipement that also processes tree nuts (almonds) and eggs. Peanut butter protein coating (maltitol, palm kernel oil, milk protein isolate, peanut flour, peanuts, nonfat milk solids, soy lecithin, salt, natural flavors), Supreme Protein®Blend (whey protein isolate, whey protein concentrate, milk protein isolate), jelly layer (crystalline maltitol, fructose, water, glycerine, fractioned palm kernel oil, sugar, freeze dried strawberry powder, food starch-modified, pectin, natural flavors [dairy], soy lecithin), glycerine, whey protein crisps (whey protein concentrate, rice flour), water, hydrolyzed collagen, soy protein isolate, peanut flour, protein crisps (isolated soy protein, tapioca starch, salt), peanut butter (peanuts, salt), palm kernel oil, soy lecithin, vitamin mix (dicalcium phosphate, magnesium phosphate, dl-alpha-tocopherol acetate, ascorbic acid, copper gluconate, niacinamide, vitamin a palmitate, ferric orthophosphate, biotin, zinc oxide, pyridoxine hydrochloride, vitamin b12, folic acid, manganese sulfate, calcium d-pantothenate, riboflavin, sodium selenite), salt, potassium sorbate (a preservative), wheat protein isolate, almond butter (dry roasted almonds). Contains Peanuts, Soy, Milk, Almonds And Wheat. Produced on equipment that also processes eggs and tree nuts. This product contains glycerine which is not a carbohydrate but has 4.32 calories per gram. Chocolate flavored coating (whey protein concentrate, palm kernel oil, maltitol, cocoa powder, sugar, soy lecithin, vanilla), Supreme Protein® Blend (whey protein isolate, whey protein concentrate, milk protein isolate), peanuts, peanut butter (peanuts, salt), powdered sugar, maltodextrin, water, protein crisps (isolated soy protein, tapioca starch, salt), hydrolyzed collagen, soy lecithin, vitamin mix (dicalcium phosphate, magnesium phosphate, DL-alpha-tocopherol acetate [vitamin E], ascorbic acid [vitamin C], copper gluconate, niacinamide [niacin], vitamin A palmitate, ferric orthophosphate, biotin, zinc oxide, pyridoxine hydrochloride [vitamin B6], cyanocobalamin [vitamin B12], folic acid [folate], manganese sulfate, calcium D-pantothenate, riboflavin[vitamin B2], sodium selenite), salt, potassium sorbate (a preservative), wheat protein isolate, almond butter (dry roasted almonds). Allergen Information: Contains Peanuts, Soy, Milk, almonds and Wheat. Produced on Equipment that also processes Eggs and Tree Nuts. Peanut butter flavored protein coating (maltitol, palm kernel oil, milk protein isolate, peanut flour, peanuts, nonfat milk solids, soy lecithin, salt, natural flavors), supreme protein® blend (whey protein isolate, whey protein concentrate, milk protein isolate), caramel layer (maltitol, sweetened condensed milk, hydrogenated coconut oil, butter [salted], corn starch, vanilla extract, caramel color), glycerine, peanuts, water, pretzels (wheat flour, salt, vegetable oil [may contain one or more of the following: corn, canola, cottonseed, soybean], corn syrup, sodium bicarbonate, yeast), soy protein isolate, peanut flour, peanut butter (peanuts, salt), protein crisps (isolated soy protein, tapioca starch, salt), hydrolyzed collagen, palm kernel oil, soy lecithin, vitamin mix (dicalcium phosphate, magnesium phosphate, dl-alpha-tocopherol acetate [Vitamin E], ascorbic acid, [vitamin c], copper gluconate, niacinamide, vitamin A palmitate, ferric orthophosphate, biotin, zinc oxide, pyridoxine hydrochloride, vitamin b12, folic acid, manganese sulfate, calcium d-pantothenate, riboflavin, sodium selenite), salt, potassium sorbate (a preservative), what protein isolate, almond butter (dry roasted almonds). Chocolate coating (whey protein concentrate, palm kernel oil, maltitol, cocoa powder, sugar, soy lecithin [an emulsifier], vanilla), Supreme protein® blend (whey protein isolate, whey protein concentrate, milk protein isolate), lycasin, glycerin, soy protein isolate, maltodextrin, water, almonds, coconut oil, cocoa powder, hydrolyzed collagen, canola oil, invertase, vanilla, chocolate flavor, soy lecithin [an emulsifier], vitamin mix (dicalcium phosphate, magnesium phosphate, dl-alpha-tocopherol acetate, ascorbic acid, copper gluconate, niacinamide, vitamin A palmitate, ferric orthophosphate, biotin, zinc oxide, pyridoxine hydrochloride, vitamin B12, folic acid, manganese sulfate, calcium d-pantothenate, riboflavin, sodium selenite), salt, potassium sorbate (a preservative), peanut paste (peanuts salt), wheat protein isolate, almond butter (dry roasted almonds). ALLERGEN INFORMATION: Contains peanuts, almonds, soy, wheat and milk. Produced on equipment that also processes eggs and tree nuts. Chocolate Coating (Whey Protein Concentrate, Palm Kernel Oil, Maltitol, Cocoa Powder, Sugar, Soy Lecithin [An Emulsifier], Vanilla), Supreme Protein Blend (Whey Protein Isolate, Whey Protein Concentrate, Milk Protein Isolate), Caramel Layer (Maltitol, Sweetened Condensed Milk, Coconut Oil, Butter [Salted], Corn Starch, Vanilla Extract, Caramel Color), Glycerine, Water, Protein Crisps (Isolated Soy Protein, Tapioca Starch, Salt), Soy Protein Isolate, Peanut Butter (Peanuts, Salt), Peanut Flour, Hydrolyzed Collagen, Peanuts, Palm Kernel Oil, Soy Lecithin (An Emulsifier), Vitamin Mix (Dicalcium Phosphate, Magnesium Phosphate, Dl-Alpha-Tocopherol Acetate, Ascorbic Acid, Copper Gluconate, Niacinamide, Vitamin A Palmitate, Ferric Orthophosphate, Biotin, Zinc Oxide, Pyridoxine Hydrochloride, Cyanocobalamin, Folic Acid, Manganese Sulfate, Calcium D-Pantothenate, Riboflavin, Sodium Selenite), Salt, Potassium Sorbate (A Preservative), Wheat Protein Isolate, Almond Butter (Dry Roasted Almonds). Supreme protein blend (milk protein concentrate, whey protein isolate, whey protein concentrate), soy protein isolate, chocolate coating (sugar, palm kernel oil, cocoa processed with alkali, whey powder [milk], palm oil, soy lecithin [an emulsifier], salt, natural flavor), gelatin, glycerine, water, chocolate soy crisps (isolated soy protein, cocoa powder, tapioca starch, salt), butter, artificial flavors, soy lecithin, cocoa drops (sugar, partially hydrogenated vegetable oil [palm kernel oil, coconut oil, palm], cocoa processed with alkali, dextrose, cocoa powder, whey powder [milk], soy lecithin [an emulsifier], vanillin), vitamin mix (dicalcium phosphate, dl-alpha-tocopherol acetate, ascorbic acid, copper gluconate, niacinamide, vitamin A palmitate, ferric orthophosphate, biotin, zinc oxide, pyridoxine, hydrochloride, cyanocobalamin, folic acid, manganese sulfate, calcium d-pantothenate, riboflavin, sodium selenite, thiamine mononitrate), salt, potassium sorbate, sucralose, peanut butter (peanuts, salt, palm oil). 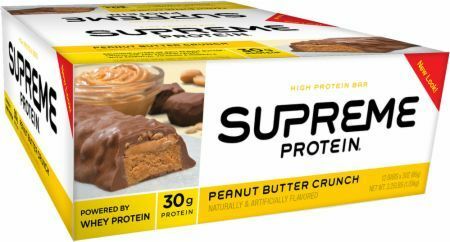 Supreme protein blend™ 30g: (whey protein isolate, whey protein concentrate, milk protein isolate), chocolate coating (whey protein concentrate, palm kernel oil, maltitol, cocoa powder, sugar, soy lecithin [an emulsifier], vanillin), vanilla cream (high fructose corn syrup, corn syrup, milk protein isolate, fractionated palm kernel oil, soy lecithin, natural flavors), maltitol syrup, glycerine, chocolate protein crisps (isolated soy protein, cocoa tapioca starch), water, fractionated palm kernel oil, chocolate cookie (wheat flour, sugar, canola oil, cocoa [processed with alkali], salt, baking soda), soy protein isolate, cocoa powder, soy lecithin, natural flavors, vitamin mix, guar gum, flax seed oil, potassium sorbate, peanut paste. Contains peanuts, soy and milk products. Produced on equipment that also processes tree nuts (almonds), egg, fish and wheat. Enjoy one or more bars daily! Chocolate Coating (Whey Protein Concentrate, Palm Kernel Oil, Maltitol, Cocoa Powder, Sugar, Soy Lecithin [an Emulsifier], Vanilla), Coconut Layer (Coconut, Invert Sugar, Cocoa Butter, Citric Acid and Pure Vanilla Extract), Supreme Protein Blend (Whey Protein Isolate, Milk Protein Concentrate, Whey Protein Concentrate), Glycerine, Soy Protein Isolate, Chocolate Protein Crisps (Isolated Soy Protein, Cocoa [Processed with Alkali], Tapioca Starch), Gelatin, Water, Peanut Paste (Peanuts, Salt, Palm Oil), Almonds Cocoa Powder, Palm Kernel Oil, Natural and Artificial Flavors, Soy Lecithin, Vitamin Blend (Dicalcium Phosphate, DL-Alpha-Tocopherol Acetate, Ascorbic Acid, Copper Gluconate, Niacinamide, Vitamin A Palmitate, Ferric Orthophosphate, Biotin, Zinc Oxide, Pyridoxine, Hydrochloride, Cyanocobalamin, Folic Acid, Manganese Sulfate, Calcium D-Pantothenate, Riboflavin, Sodium Selenite), Potassium Sorbate (A Preservative), Whey Protein Isolate, Almond Butter (Dry Roasted Almonds). Peanut Butter Protein Coating (Maltitol, Palm Kernel Oil, Milk Protein Isolate, Peanut Flour, Peanuts, Nonfat Milk Solids, Soy Lecithin [An Emulsifier], Salt, Natural Flavors), Supreme Protein® Blend (Whey Protein Isolate, Whey Protein Concentrate, Milk Protein Isolate), Jelly Layer (Crystalline Maltitol, Fructose, Water, Glycerine, Fractionated Palm Kernel Oil, Sugar, Freeze Dried Strawberry Powder, Food Starch-Modified, Pectin, Natural Flavors [Dairy], Soy Lecithin), Glycerine, Whey Protein Crisps (Whey Protein Concentrate, Rice Flour), Water, Hydrolyzed Collagen, Soy Protein Isolate, Peanut Flour, Protein Crisps (Isolated Soy Protein, Tapioca Starch, Salt), Peanut Butter (Peanuts, Salt), Palm Kernel Oil, Soy Lecithin (An Emulsifier), Vitamin Mix (DiCalcium Phosphate, Magnesium Phosphate, Dl-Alpha Tocopheryl Acetate, Ascorbic Acid, Copper Gluconate, Niacinamide, Vitamin A Palmitate, Ferric Orthophosphate, Biotin, Zinc Oxide, Pyridoxine Hydrochloride, Cyanocobalamin, Folic Acid, Manganese Sulfate, Calcium D-Pantothenate, Riboflavin, Sodium Selenite), Salt, Potassium Sorbate (A Preservative), Wheat Protein Isolate, Almond Butter (Dry Roasted Almonds). ** Variety pack contains 4 Peanut Butter & Jelly, 4 Chocolate Caramel Cookie Crunch, and 4 Peanut Butter Pretzel Twist. "The Supreme Protein Carb Conscious Bar Tastes Awesome!"